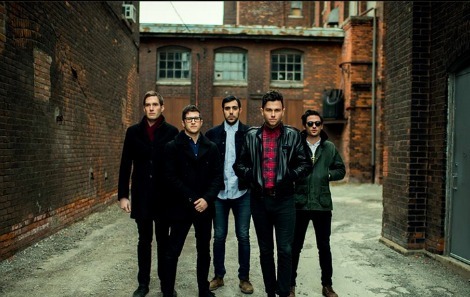 I’m currently fighting with what has been the worst hotel Internet connection I’ve ever had to work with, in order to get this post out about new music from Canadian band Arkells. I’m in sunny Miami for a conference and this might be my only window to get some new music up this week. I’m excited to share with you the song “Never Thought That This Would Happen” (via lyric video), from the bands’ forthcoming album (out later this coming summer). The song is all about their experience performing at the Hillside Festival in Guelph, summing up a magical Saturday into Sunday morning experience. The record was produced by Tony Hoffer (Beck, Air, Depeche Mode, M83) and had the band taking a workmanlike approach in their hometown of Hamilton; recording 5 days a week (with an hour for lunch) in a 150 year-old building, letting the buildings’ “natural reverb take the tunes into cinematic places”. Just like how this song perfectly fits with the weather I’m enjoying right now, close your eyes and take it in. Think warm thoughts and know this song will probably soundtrack at least some part of your summer.